The life cycle of the Atlantic Salmon is well known with the adults returning from the sea to the rivers where they hatched to spawn. They usually grow up to 76cm weighing up to 5.4kg. When seen leaping it is difficult to distinguish the Salmon from Sea trout. As juveniles they feed on things like caddis flies and mayflies. As adults they feed on other fish, squid and shrimp. 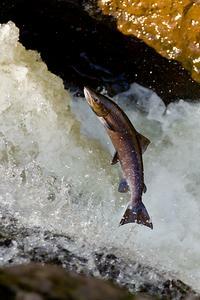 Wildlife documentaries often show the spectacle of Salmon leaping up rivers in great numbers. However, you don’t have to travel to Canada to see Salmon leaping. All of our major rivers have Salmon in them. From November to February you have the chance of seeing them jumping weirs and waterfalls to get to their spawning areas. Best spot = The Ystalyfera weir. For more information see The Atlantic Salmon Trust.